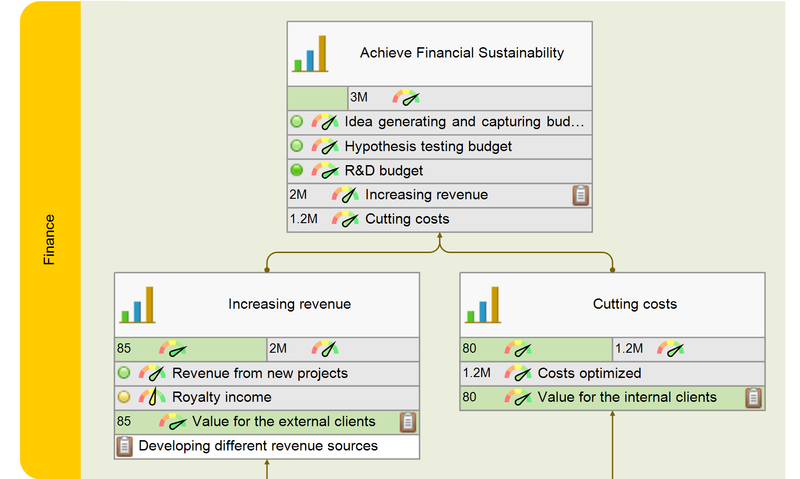 KPIs for innovation that go beyond simple R&D budgeting. Use an example of a strategy map for innovation to describe your own strategy for innovations. 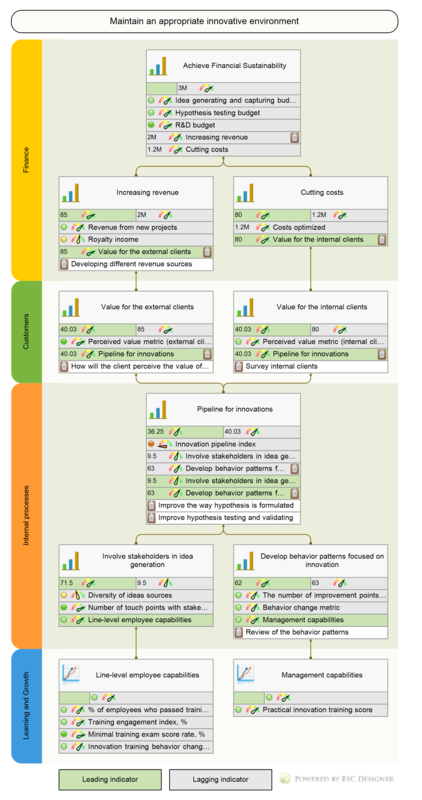 Innovations Scorecard online - sign-up with a free account for immediate access to 16 scorecard templates. Before we go ahead, let’s agree that we don’t pretend to measure the creative part of innovation, e.g. we won’t predict here if a certain innovation will be a success or not. What we can do is to make sure that an appropriate innovative environment is created and that the most promising “aha-s” find their way to the commercially successful products. According to McKinsey innovation is recognized as a one of the top three business priorities by 84% of executives. You might be surprised that the main challenge of innovation is not about generating ideas. The survey data tells the opposite: more than 50% of respondents said that they had some good ideas, but the problem is how to scale and commercialize them – a “robust pipeline” for the innovation ideas is what many organization want to have. The innovation is a priority for many organizations, but it’s not clear how to measure and manage it in an effective way. The traditional budgeting approach to measuring innovations doesn’t work. A typical innovation is not a production line that converts ideas into commercial products; it involves many stakeholders and the measurement efforts should take them into account. Here are some typical KPIs used for innovation. R&D budget or similar budgeting metrics. We cannot expect innovations to happen unless there is a budget for it, or can we? Let’s take any garage-based startup, it would certainly be easier with good funding, but things often happen without any significant investments. Metrics like Income from new products or Patents filed might be good to validate certain achievements, but due to their lagging nature it’s hard to use them in a short term management loop. Metrics that try to quantify the leading part of innovation like Innovative ideas or Number of active projects suggest moving into the right direction (“more ideas -> “more active projects” -> “more income from innovations”), but they don’t suggest a clue to how to get there. The result might a portfolio of the “innovative projects” that satisfy the annual indicators for innovation, but it doesn’t help an organization to achieve its goals. Now, let’s talk about building a measurement and management system for innovations that can address the challenges mentioned above. In the 10 Step KPIs System book I wrote about the importance of quick estimations. Before building a complex measurement system, let’s find out where we are now, and what measurement tool is the most appropriate. 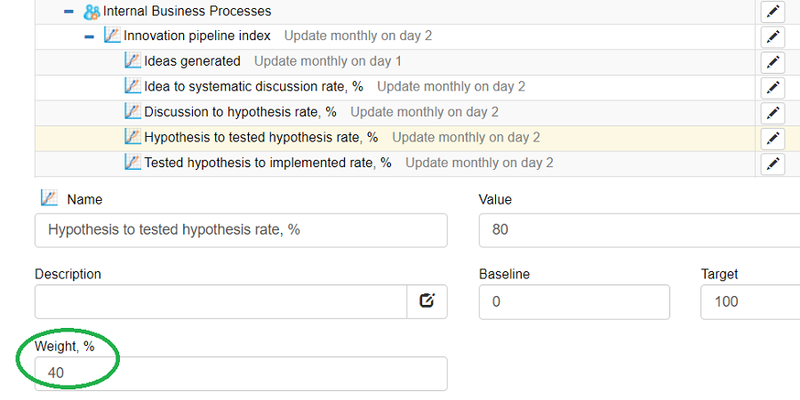 Suggest your team to list the hypotheses (innovative ones) that they have tested recently. What situation do you face? There were only “boring” ideas. Probably you need to l0ok at the list of stakeholders and get more ideas from them. There were some hypotheses, but there was no budget to test/implement them. Start from basic budgeting metrics. There were some ideas, but they have never been converted into hypotheses, and respectively were never tested. Look at the innovative process (see more details below). Look at the capabilities of the team, probably they need to pass innovation training first. There were some hypotheses, but they were implemented on a small scale only. The problem is probably with the sponsorship of the ideas by top managers. We will talk about this below. Who is involved in the innovations? It’s not just your R&D and Management. Let’s list some of the typical stakeholders and talk about their role in the innovations. One of the trends in the context of innovation is fanatically focusing on the needs/problems of the clients and building innovation around those needs. But what about the leading part? How can the leading metrics can be formulated for the domain of innovations? How can we predict that the company will create these innovations? What is a profile of a company that most likely won’t be able to innovate? We can go ahead and list more behavior patterns that have negative influence on the innovative potential. My point is that the innovative companies will do exactly the opposite things. Do you need to measure how innovative your company is? Quantify and measure those behavior patterns. Who might suggest an innovation? Employees, partners, clients? Are the members of your team using your product or service as end-users? How actively can your team experiment? How innovative is your environment? Where do those ideas come from? What might be the inputs for the innovation? Do the members of your team read the books in their domain, visit conferences? Can we expect that someone who visited a conference can write down a list of 5 ideas that your team can try later? That’s easy if someone watched the presentations and networked with colleagues! Spanish Mercadona is an excellent example of how an effective innovative environment can be organized. They invest in co-innovation centers, where their “jefes” (the clients) have the opportunity to experience new products. According to the study by Institut Cerdà, the success rate of the products that passed the co-innovation is 82% compared to the industry average 24%. This initiative is not a random success, actually, the supermarket chain has a strong innovation strategy that is supported by investment in training of new hires (four weeks of training) and annual training (20 additional hours each year). See the “Learning and growth” perspective below for the example of how the training initiatives can be aligned with innovation strategy. 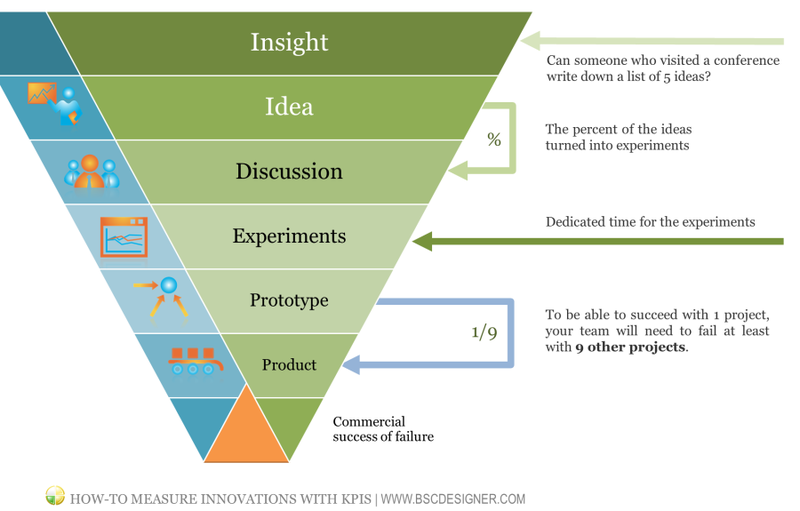 Insight > Idea > Discussion > Experiments > Prototype > Product > Commercial success of failure. If you ask any entrepreneur about the number of his or her successful projects, you would hear something like 3 of 10 projects fail, 6 of 10 are poor performers, 1 of 10 is where we can achieve excellence. What do these numbers tell us in terms of innovation? To be able to succeed with 1 project, your team will need to have as many as 9 other projects fail. And make sure your teams are really trying and not giving away some random projects as failures. Now, let’s put together all the discussed ideas and create an example/template of a strategy map for innovation. To achieve financial sustainability (increase market share, increase revenue, cutting costs, developing different revenue sources) an organization needs to innovate for internal clients (business units) and for the external clients (end users). Value for the external clients. What problem of the external clients (end-users) could the innovation solve? Value for the internal clients. What problem of the internal clients (business units, partners) could the innovation solve? How to measure the value? How will the client perceive the value of the new offer? Is something is working faster; or is a higher quality provided at a lower cost? Sometimes it’s hard to quantify the specific value delivered. For example, what value does Facebook provide? We can certainly compare the speed of photo publishing compared to a real-world photo book, but it’s obviously not the major value driver. A great way to socialize, or easy contact with your connections might be. If you are interested in this particular example, just search in Google for “What problem does Facebook solve?” and I’m sure you’ll find many interesting ideas for the value metrics. Quantifying the process in this way helps to see where the performance bottlenecks are and think about prevention plan. Additionally, we can pack these metrics into an “Innovation pipeline index” indicator. The metrics responsible for performance bottlenecks should be counted with a higher weight than those ones responsible for the processes that are running without any issues. Try expressing these two goals explicitly on the strategy map. Goal: Involve stakeholders in idea generation. Possible metrics: Number of touch points where the idea can be obtained from the stakeholder. For example, clients are more likely to share their ideas in a brief survey or during a personal phone call. The lagging metric might be related to the diversity of ideas sources in general, or you might want to set a specific target to get at least 10 qualified ideas from the clients each month. Instead of describing how you think you innovate, ask some 3rd party to review your innovation process and describe how it is working in practice. Some behavior change metric (faster idea turnaround, less bureaucracy, information silos broken). Finally, we need to understand the gap between current capabilities of the team and the capabilities needed to innovate effectively. On the line-level the capabilities gap might be addressed by training innovations as a separate discipline. Now, we can build a strategy map that would describe an approach of the organization to the innovations. Is there a good way to get an idea from the customers? Like for example, properly implemented surveys? Is there a quick way to validate new ideas with customers? 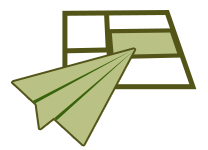 Does your team have enough capabilities to read “between-line” the needs of the client? Here are some thoughts about a road map for innovation measurement. Diagnose current situation in your organization (see the “quick estimation” section). Build an innovation pipeline, visualize the way that an innovation passes from the level of idea to the level of commercial product. 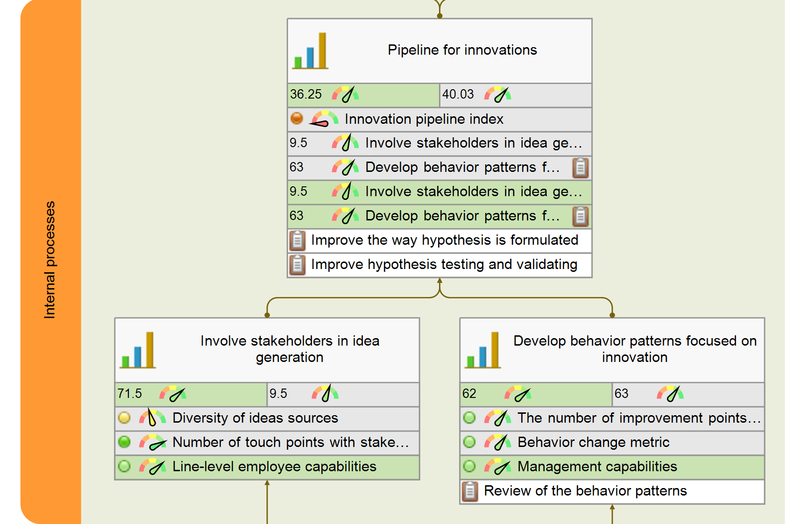 Build a strategy map for innovations in your organization. The one discussed in this article might be a good starting point, but make sure you customize it according to your needs. Make sure that the innovation strategy is not a standalone product, but is a part of a company’s strategy. What can we expect from following this disciplined approach to the innovations? Switching a focus from lagging financial metrics to the leading capabilities- and business system metrics. Innovations Scorecard discussed in this article as a starting template for your own scorecard! Do you know an interesting case about measuring and managing innovations? Feel free to share in the comments!